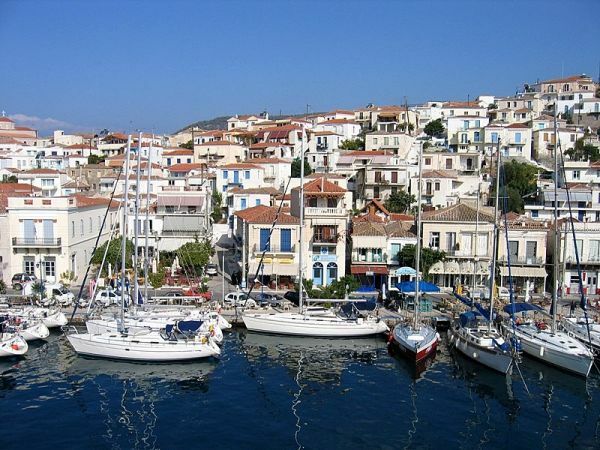 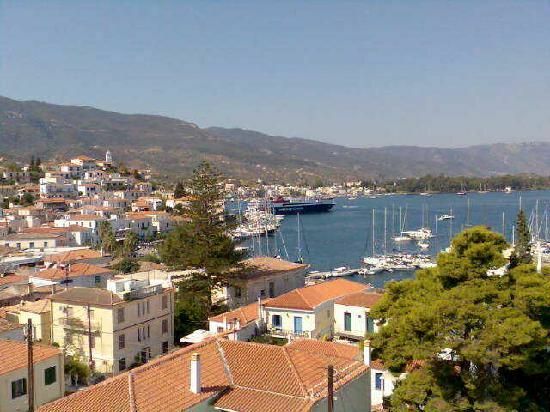 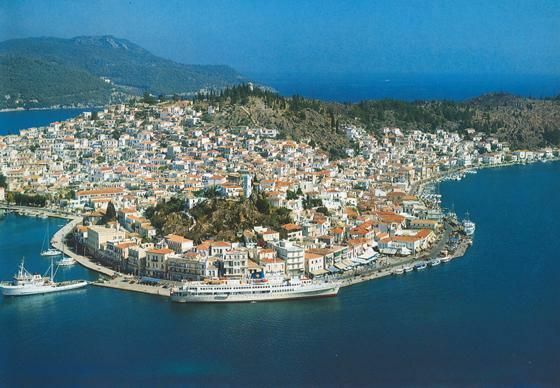 The Town of Poros impresses the visitors from the very first moment. 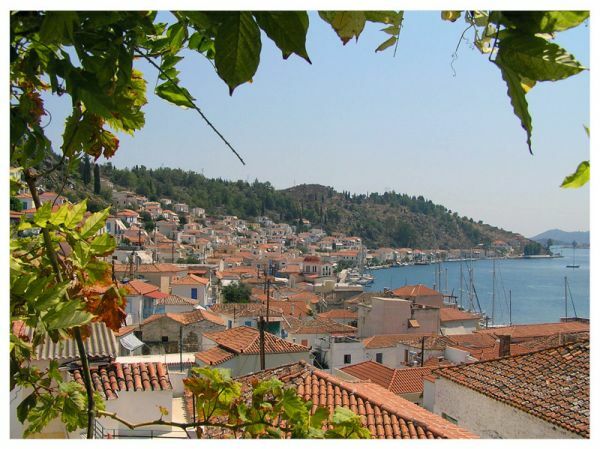 It is built amphitheatrically on the small peninsula of Sferia, overlooking the narrow canal of unique beauty, which separates it from the town of Galatas in Trizinia, Peloponese. 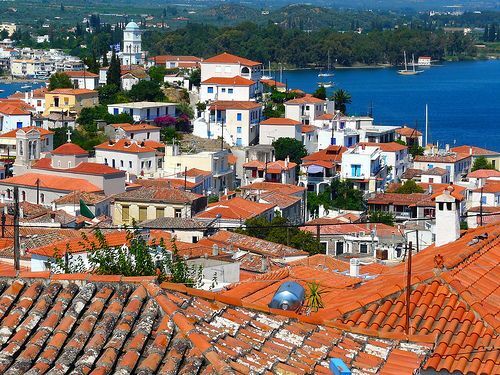 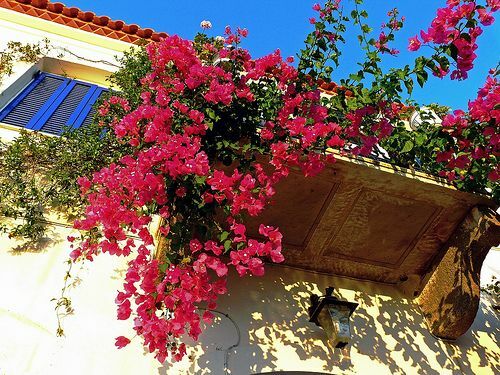 It is a very picturesque traditional town with beautiful neo-classical and simple red-tiled houses. 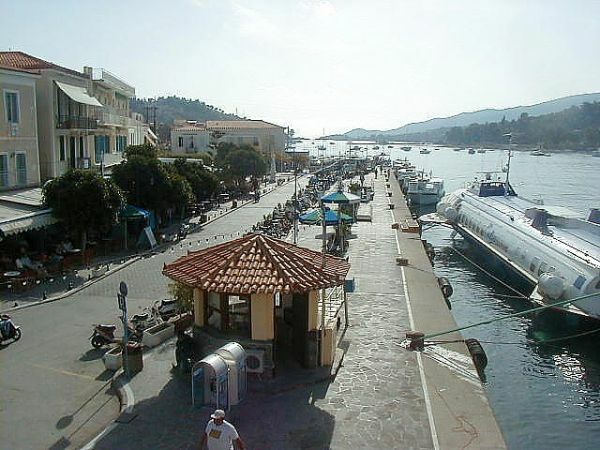 The main port of Poros is found in front of the town. 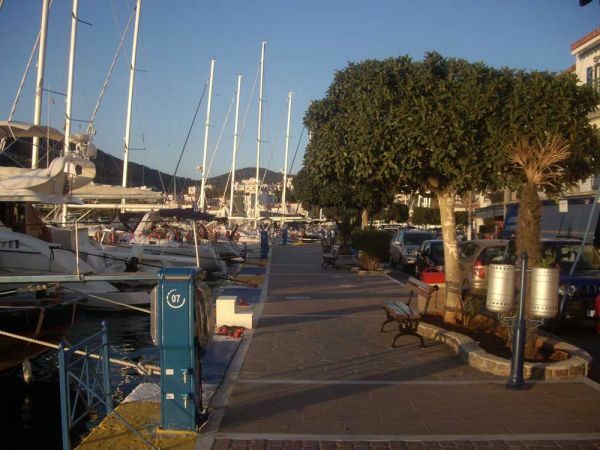 It is totally protected and therefore attracts many yachts which are moored along its "endless" quay. 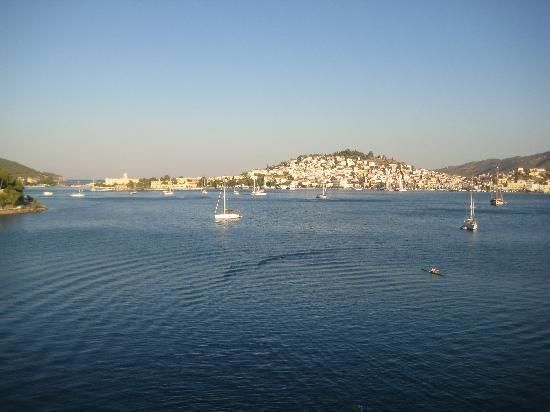 It is a busy port with numerous flying dolphins and ferries which connect the island with Piraeus (Athens), Aegina, Hydra, Porto Heli, Spetses, Methana (Peloponese), Ermioni (Peloponese) and Galatas (Peloponese). 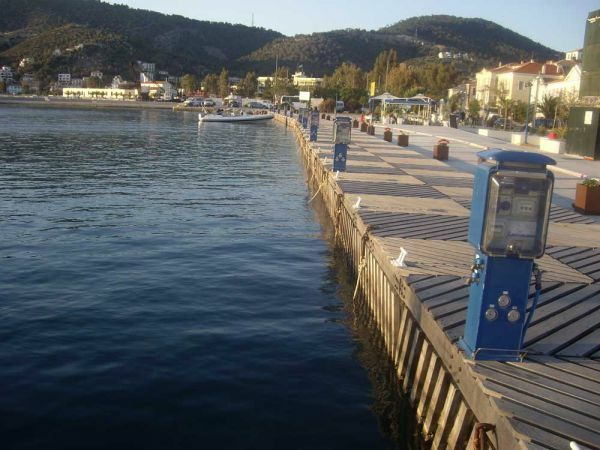 The trip to Galatas lasts only 5 minutes and can be also done by small caiques that offer regular schedules. 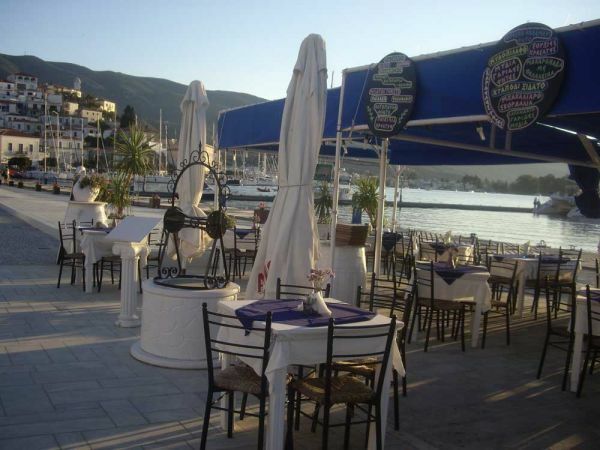 The scenic coastal road which is parallel to the quay and to the canal has wide pavements, nice squares and numerous tavernas, cafes, bars and clubs. 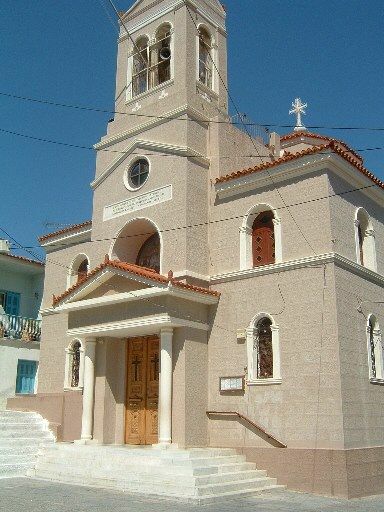 It is worth walking towards its south end, until you reach the little graphic chapel which lies just above the sea. 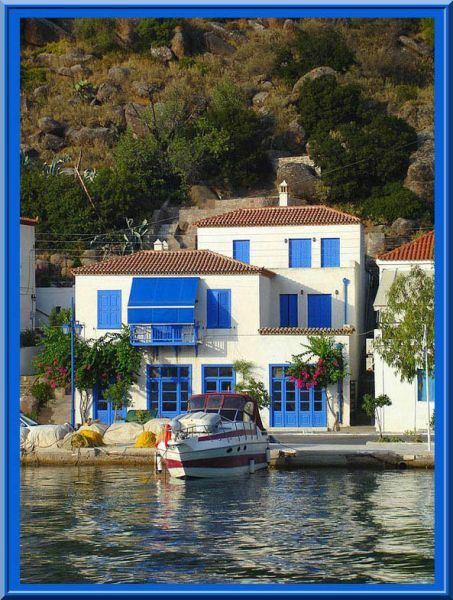 You will be charmed by the colourful two-storey houses, the beauty of the canal and the boats that sail through it. 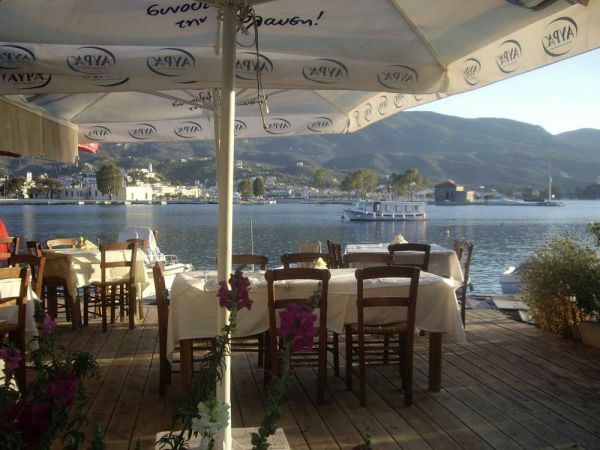 On your way you may enjoy a greek "meze" and an ouzo at one of the traditional tavernas on the quay. 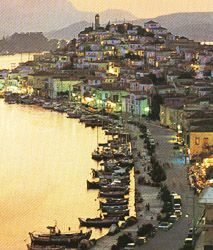 However this romantic town has many more to offer. 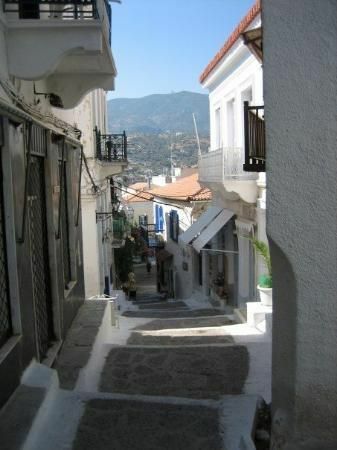 You should stroll through its stonepaved narrow streets and explore it. 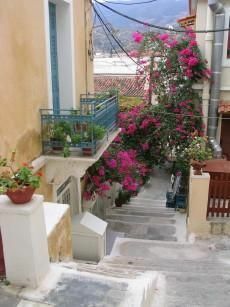 Start from the little pedestrian road which is parallel to the coastal road. 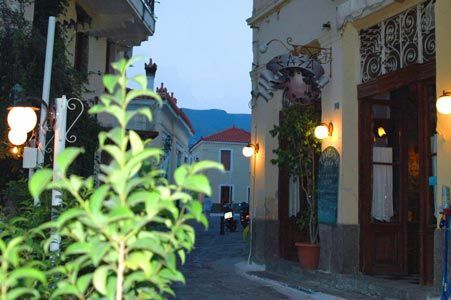 There, you will find little shops selling souvenirs, clothes, accessories and many more. 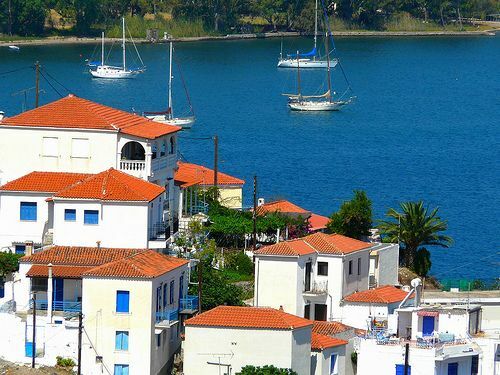 In Koryzi square, which is found on the southern side of coastal road, there is the Archaeological Museum of Poros. 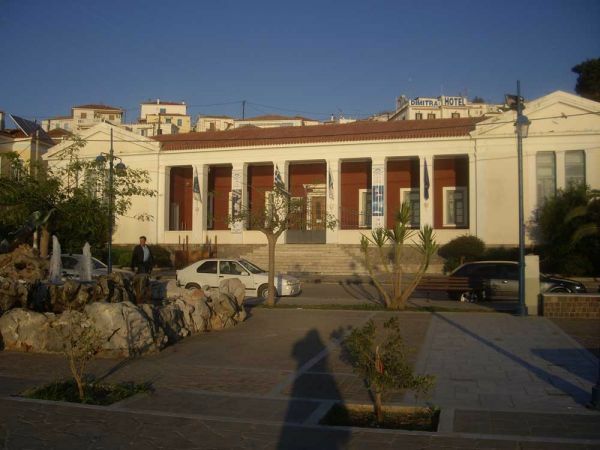 It is also worth visiting the "Hatzopoulios" Municipal Library which also houses a "Shell Museum". 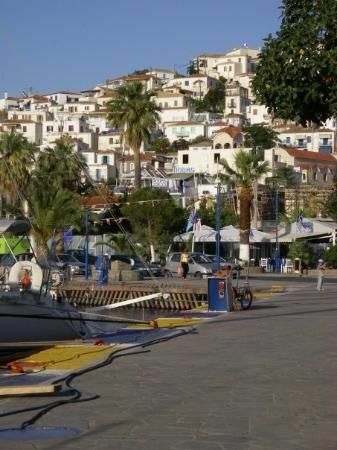 Continue the exploration towards the inner town, which is mainly residential. 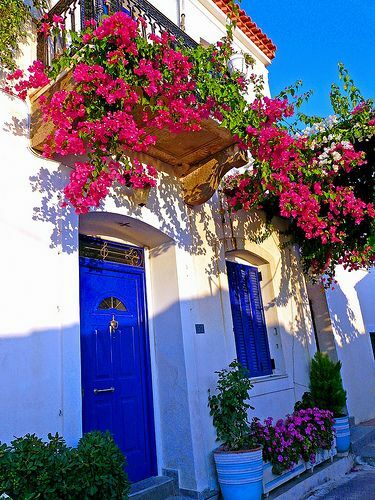 You will pass by beautiful houses with blossomed alleys and you will have the chance to get closer to the locals' everyday life. 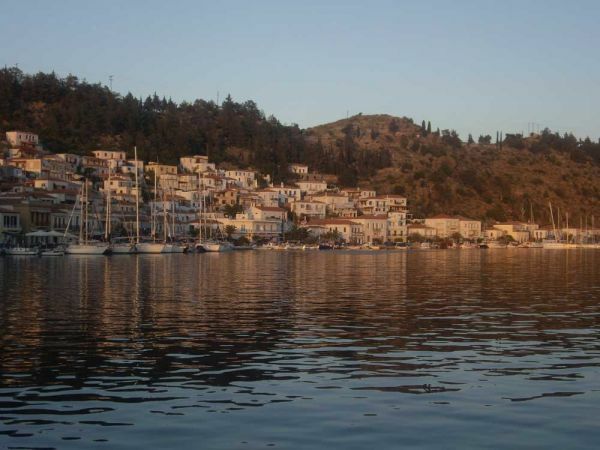 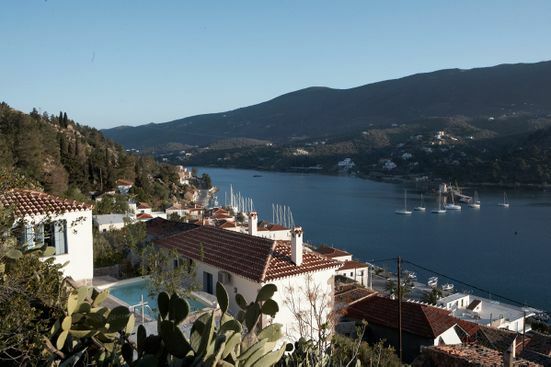 As you forward uphill you will admire the stunning views of the canal, the town of Galatas and the beautiful verdant coasts of Poros and Peloponese. 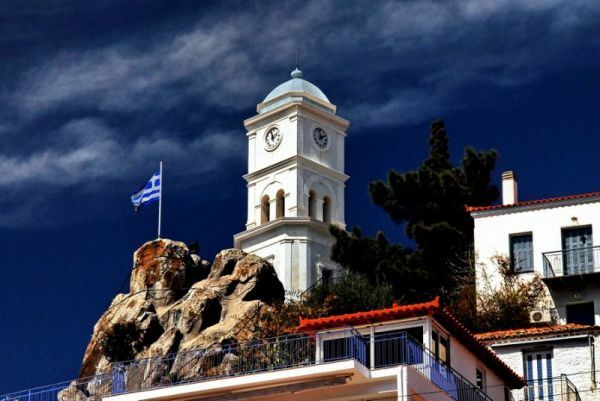 It is worth to reach the old Clock Tower (1927), which is the landmark of the island and stands on the top of the hill. 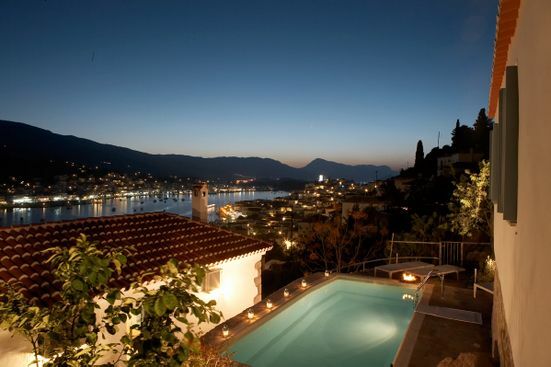 The view from there is breathtaking! 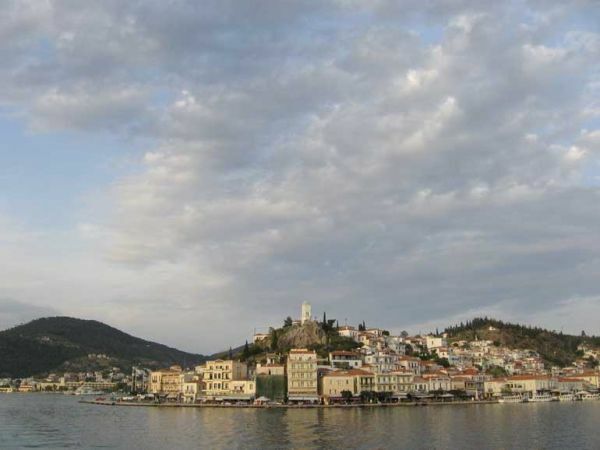 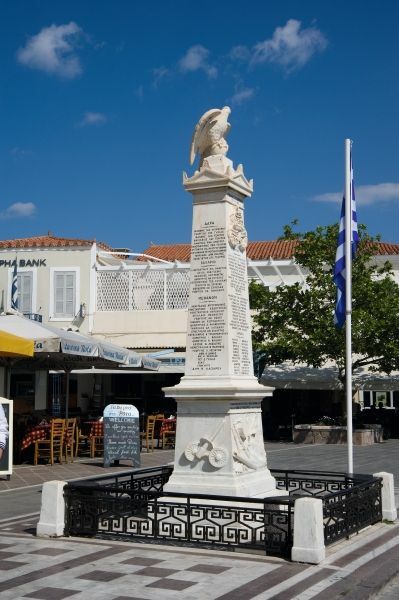 Another picturesque spot of Poros town is the square of Saint George, where the so named cathedral is found. 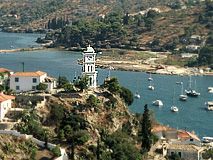 The cathedral is decorated with wonderful wallpaintings of the famous Greek painter K. Parthenis. 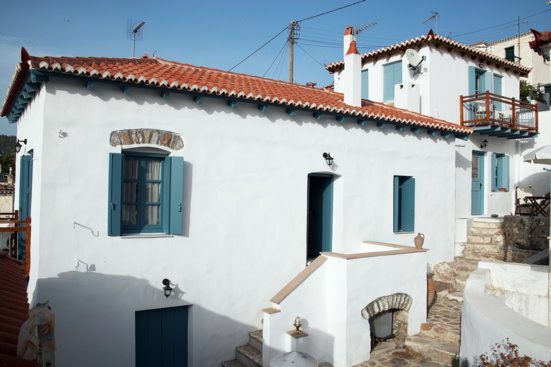 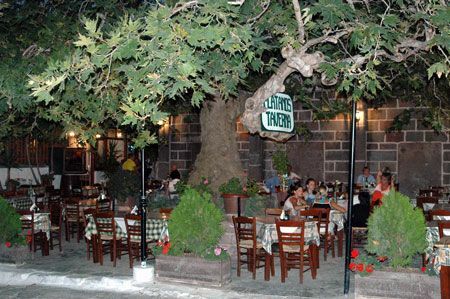 The square has beautiful traditional houses, an old plane tree and two traditional tavernas. 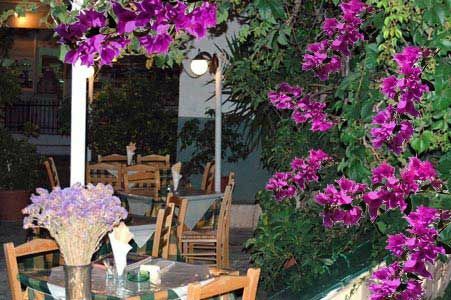 In the summer you can have a nice meal in their stone paved alleys, under the plane tree and the blossomed bouganvilles. 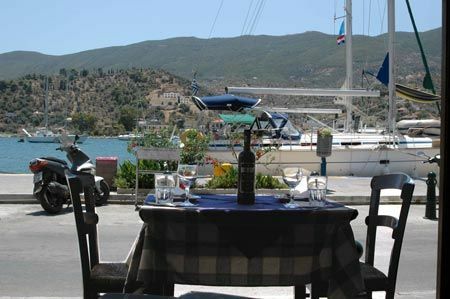 The tavernas are also open during the winter. 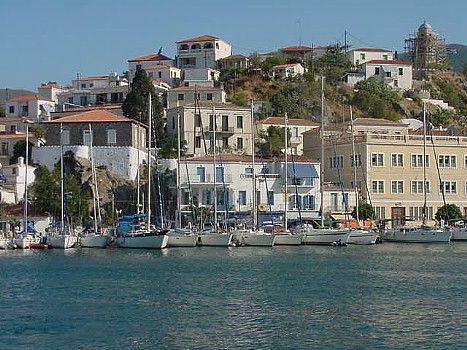 The easiest way to reach Saint George square is from the northern side of the port, where there is a small gallery and a pharmacy. 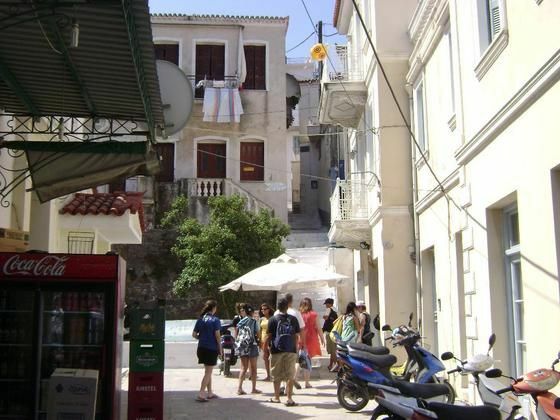 You should follow the uphill road which starts from the tiny sqaure, next to the pharmacy. 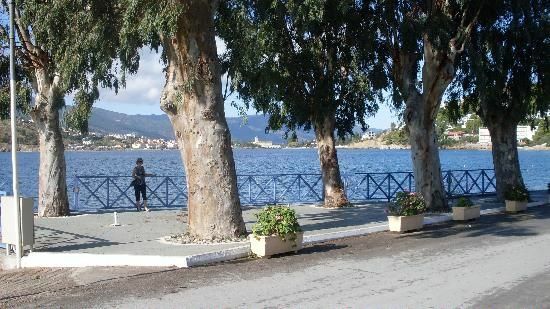 At the end of this road (after 2-3 minutes) you should turn right and you will see the little square. 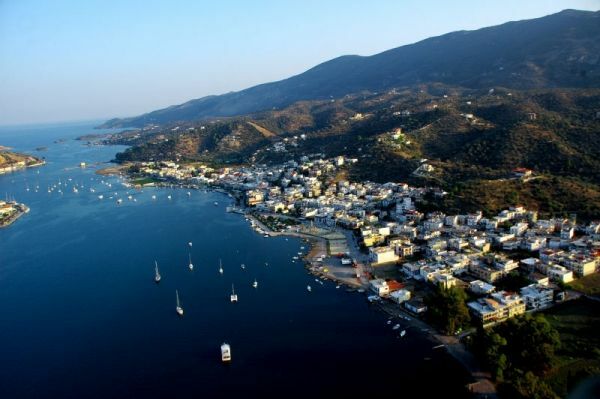 Another coastal road that is worth walking is the one that leads to Neorion. 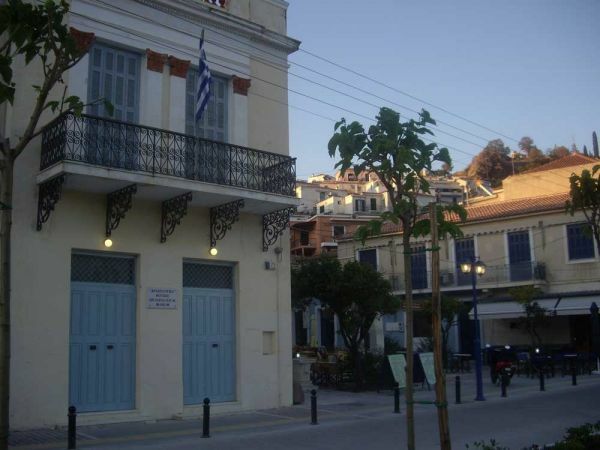 You will pass the Naval Academy, and the historic building of Progymnastirion, which was the first residence of King Othon of Greece. 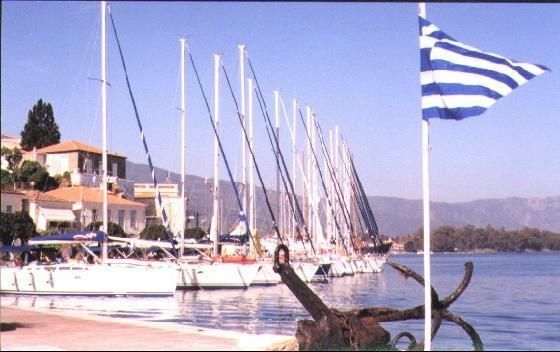 Today, it is the place where the pretraing of Greek sailors takes place. 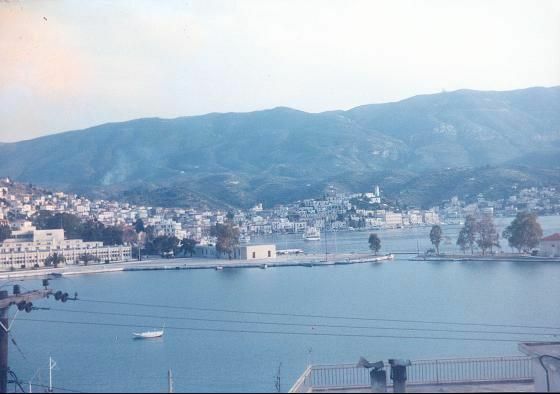 Then you will see Kanali. 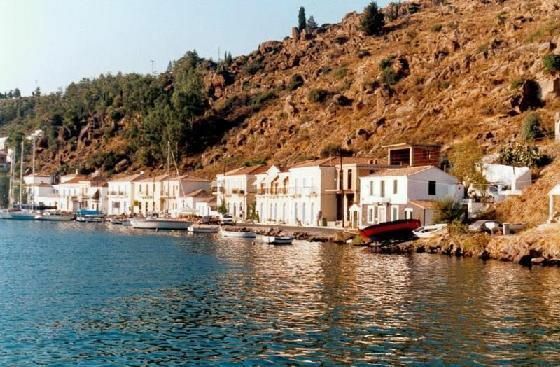 It is a tiny canal with a bridge that connects the little island of Sferia with the larger island, Kalavria. 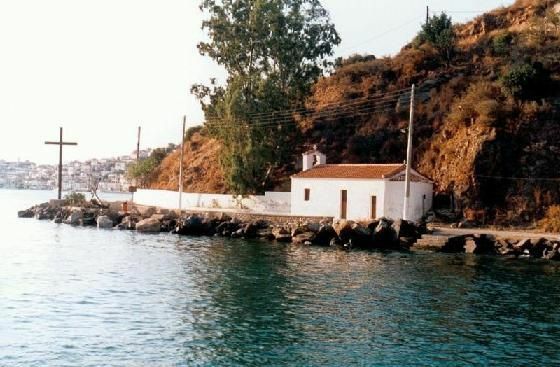 On your right, there is the beach of Kanali and the road that leads to Askeli. 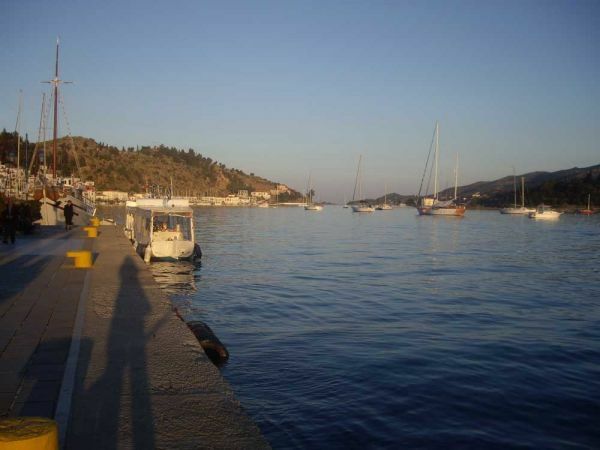 Follow the road on your left that leads to the coastal area of Perlia. 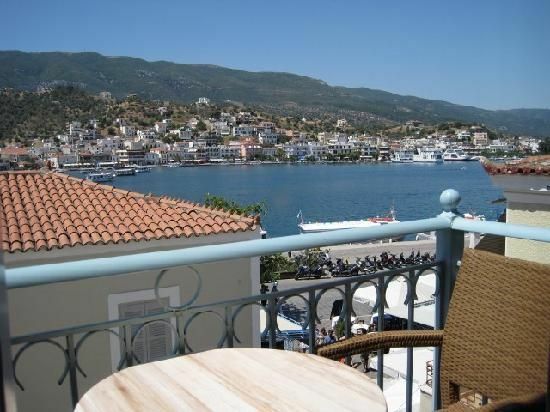 On the road you will find three nice tavernas which have tables on the beach and offer great views of Poros town. 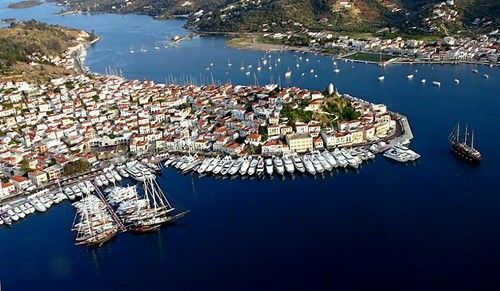 For more information please see the "Tour of Poros Island". 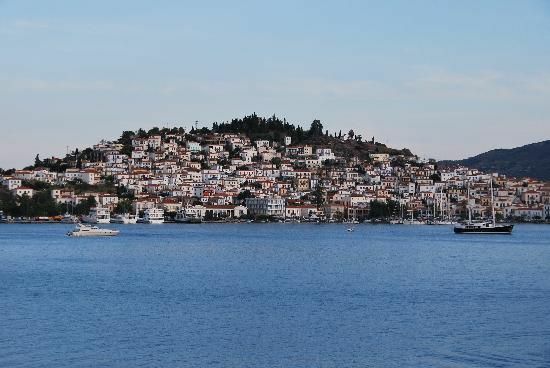 The main port of Poros is one of the safest and most beautiful ports in Greece. 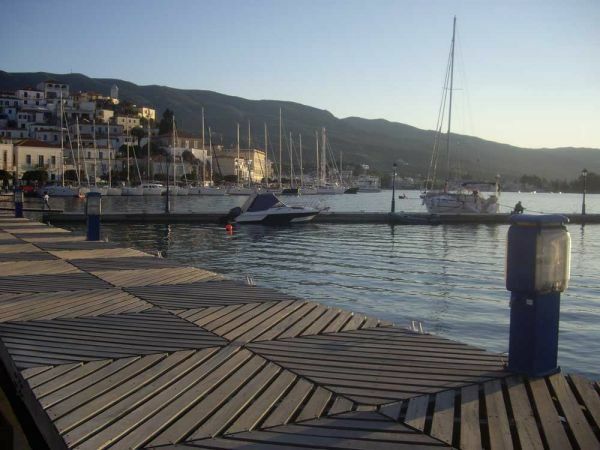 It is found inside a large bay, which is protected from every side and therefore it is used by many boats as a year round shelter. 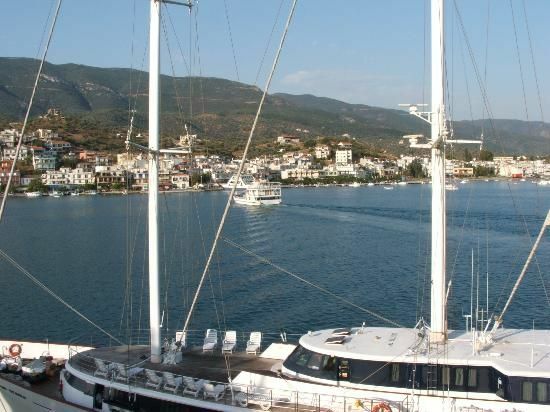 Many yachts have permanent moorings inside the bay. 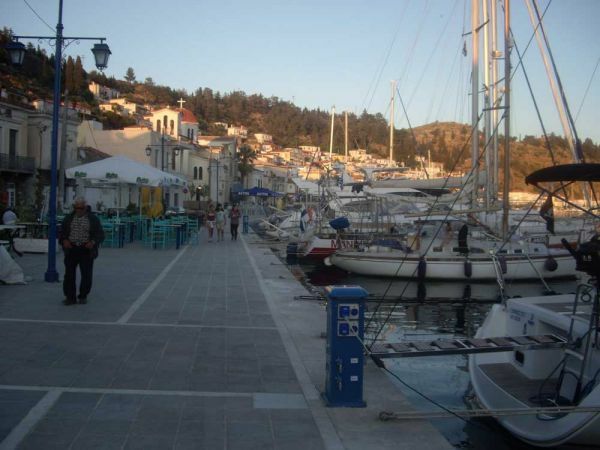 Additionally, it offers many facilities and an "endless" quay, so finding a place to moor is easy. 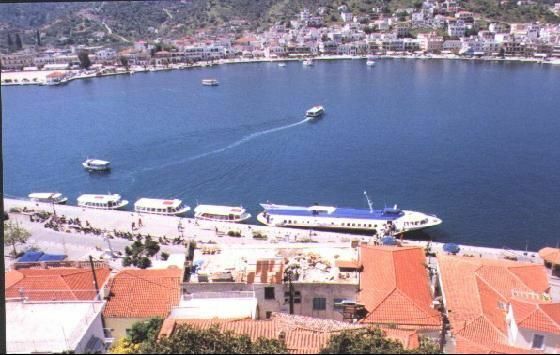 However there is a constant wash caused by the wakes of the many ferries and boats that pass by. 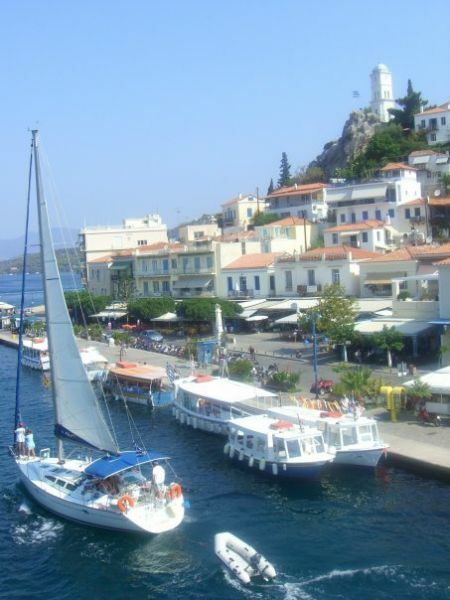 With southeries there can be gusts. 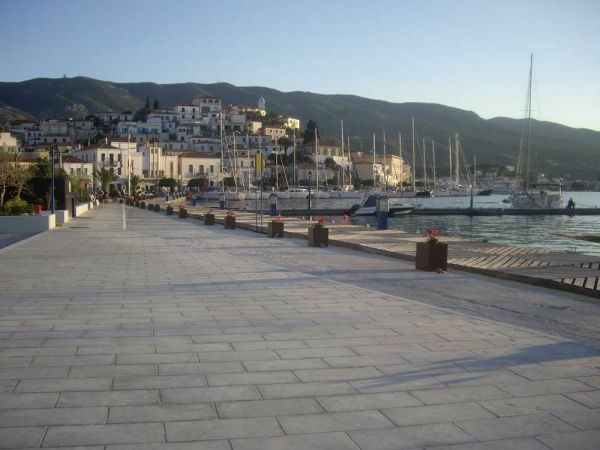 The south quay which is parallel to the canal does not have that much wash from the boats' wakes and is better protected. 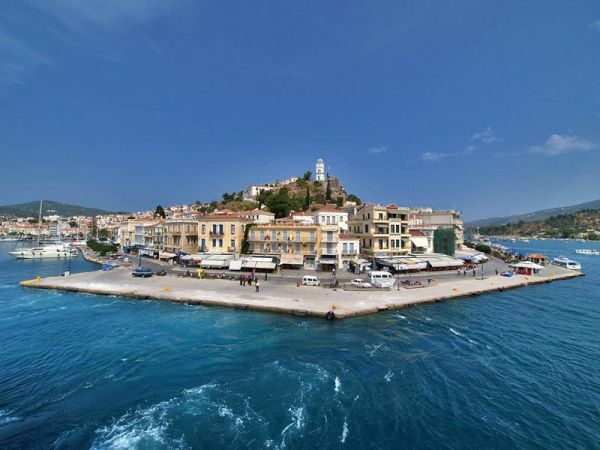 However it is more difficult to find a place there. 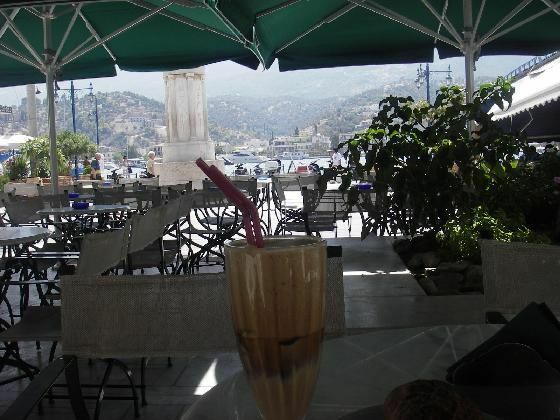 Sometimes, during the hot summer days there is a bad smell. 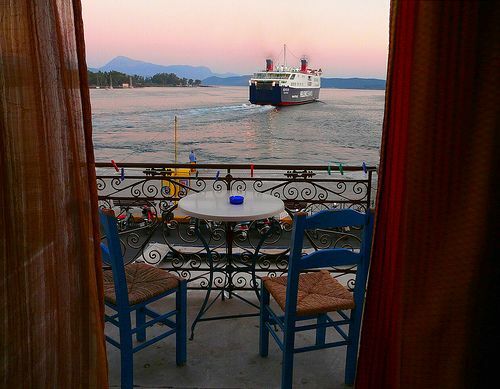 Avoid mooring in front of the bars because in peak days, they play very loud music until the early morning hours. 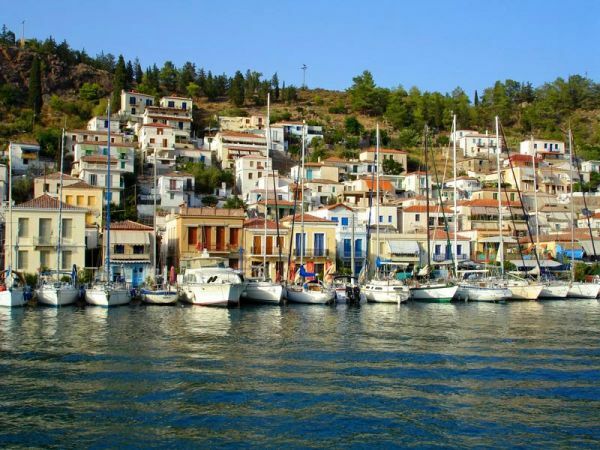 Anchors usually get tangled there. 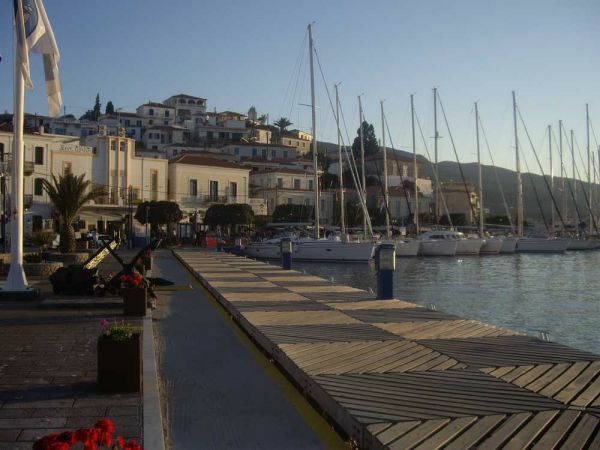 The northern quay is less crowded but has more wash from the boats' wakes. 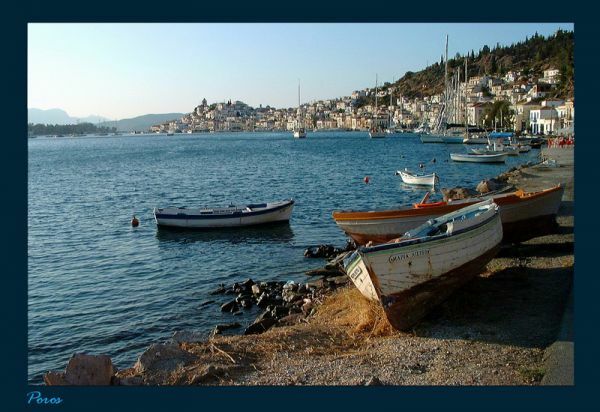 You should be sure that your anchor holds well. 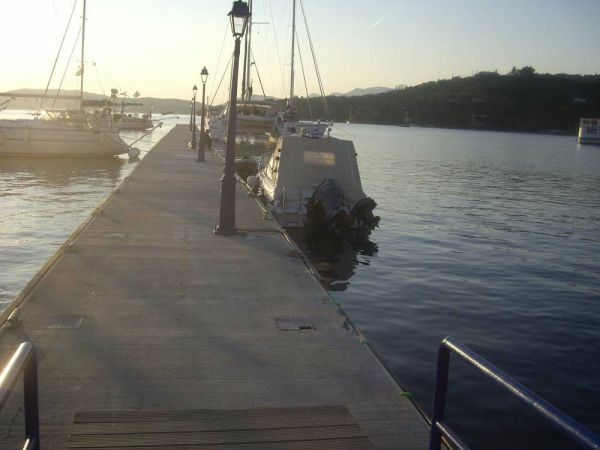 Leave as much chain as possible and a distance from the quay with long stern lines to protect your boat from the swell. 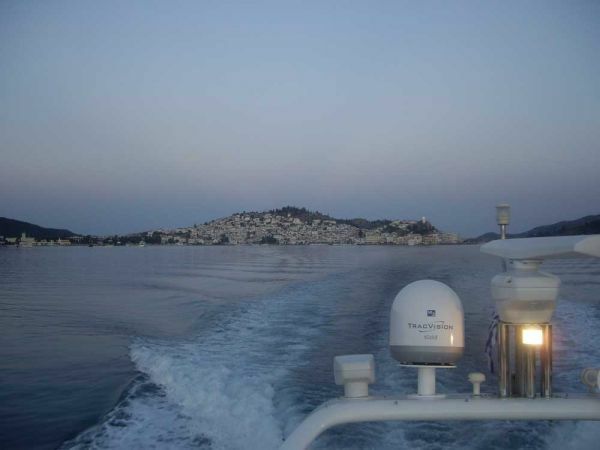 WARNINGS/HAZARDS: Constant 929wake from the ferries and the other boats that pass by. 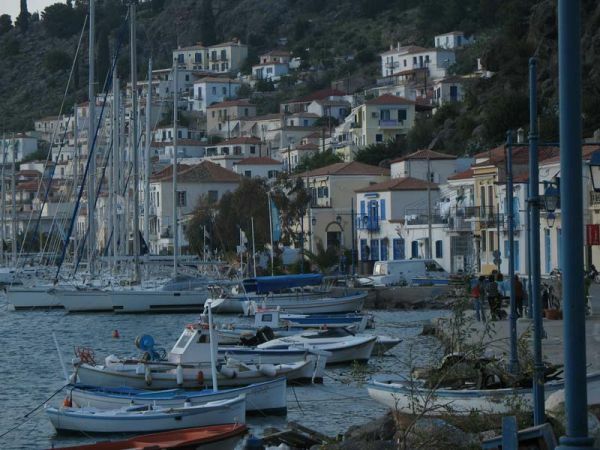 Anchors usually tangle. 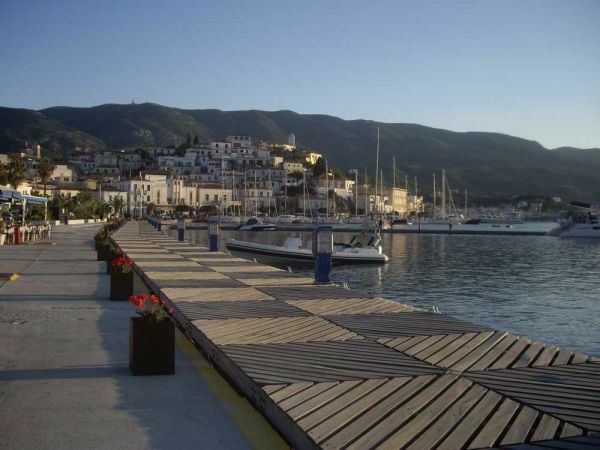 FACILITIES: Power and water supply outlets are offered on the quay. 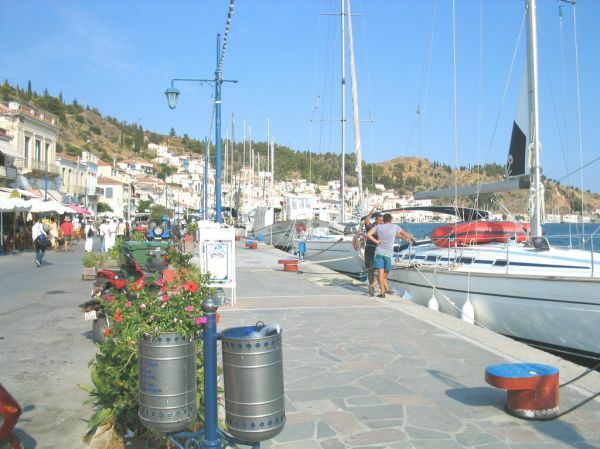 Fuel is delivered on the quay. 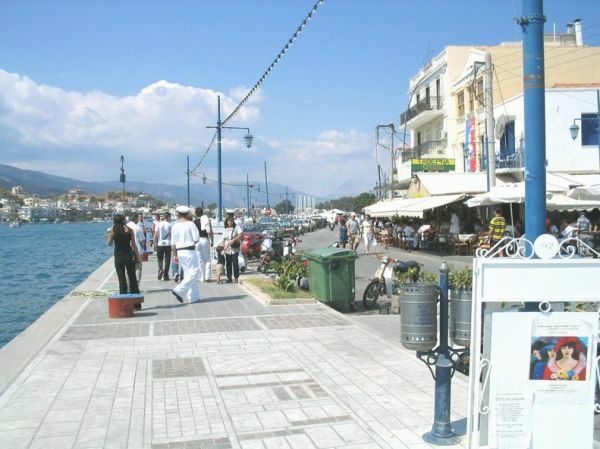 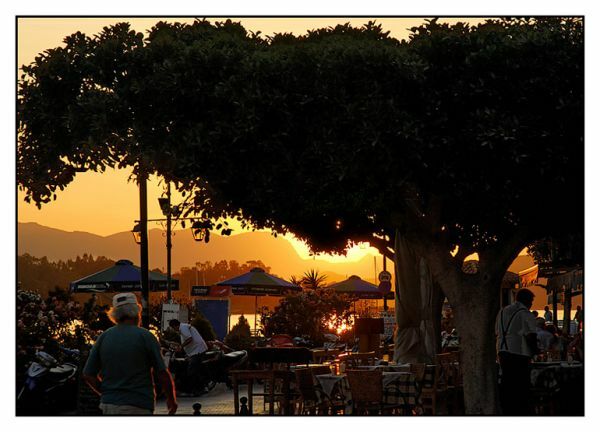 Many super markets, shops, cafes, tavernas, bars, museums etc conviniently located on the quay. 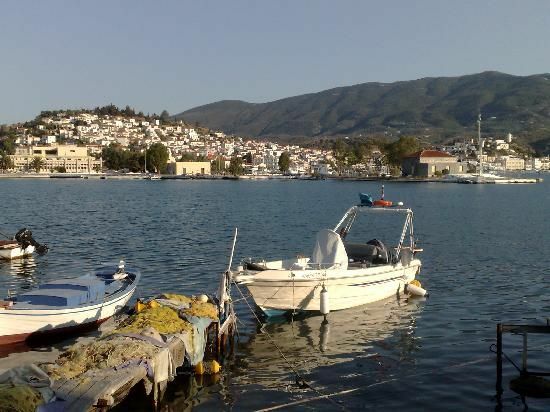 TIP: In Poros port there is a guy who can unoficially help you to moor and give you any other information you may need. 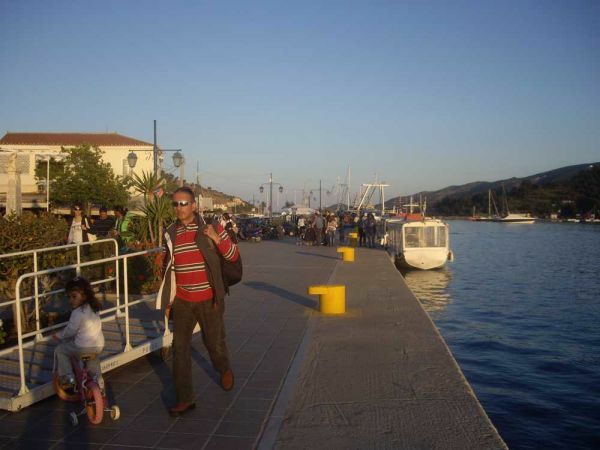 His name is Lefteris and you can call him on his mobile before you arrive, in order to wait for you on the quay. 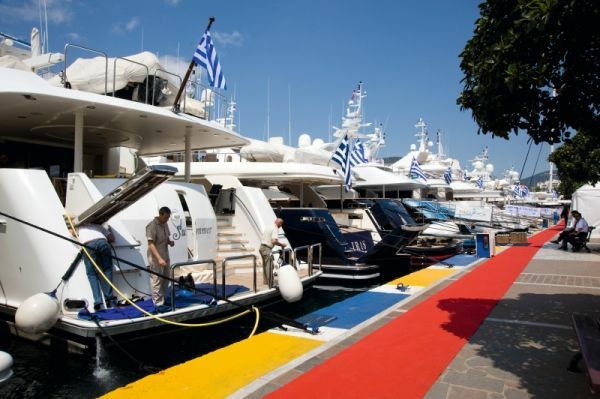 As he is not an employee of the port, he will be expecting a "tip" (which should be normally proportinate to the size of your boat) in case you use his services.